No matter how tough it can get in the process; how hard one has to work to get there; or how frustrating in can be on the way, being about to shoot a feature film is always a privilege. With the privileges come the responsibilities, of course, but also the pleasure and satisfaction of going out there and fight for what we believe in. I am about to have this privilege again with my new movie called “Karakara” and I do feel awfully good about it. The movie will take place entirely in Okinawa, Japan. “Karakara” tells the story of a 61 year old French Canadian who feels lost at this particular time in his life. He is shaken in his own beliefs as he is confronted to a different culture and a younger woman who has other projects for him. For those of you who may wonder what “Karakara” means, here is a picture of one. 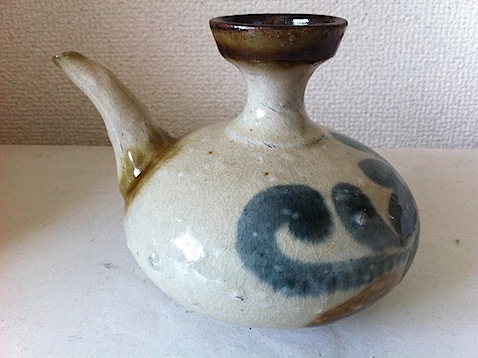 It’s a kind of pitcher to serve “Awamori”, the distilled liquor made out of rice and typical of Okinawa. The movie will explain more about the meaning of this “Karakara” and possibly give some fun clues as to how to put some spices in our lives. I hate to sound negative about the work of people I truly appreciate and respect. I wish my trip had made me come to a different conclusion. Anyway, here are some of my thoughts. I don’t pretend to know nor have understood everything, but I present my perspective, honestly, hoping to bring my small contribution to a branch of cinema that has been so valuable to many filmmakers and find itself in great danger of disappearing. As I saw it, a lot of the theater owners are badly isolated, often too busy to run their theaters and try to pay their bills. They have no time nor energy left to find any new solutions or to even identify the problems as to why the people don’t show up anymore. They are so overloaded with work and financial pressure that they can’t think of any solution to improve their faith. All of them are absolute film buffs, well educated and always passionate: unfortunately, they are not necessarily good businessmen, nor marketing specialists. But whichever way we look at it, things have changed over the years, and we need to adapt if we want to survive. I don’t pretend to detain the truth, but here are the things that I would do, or at least explore, if I were a theater owner. Of course, from an ideological point of view, this could all well sound like a total and definite heresy. I still dive, because I believe that Art Houses won’t survive in the actual state of things. B) Sell the name: It must sound terrible for someone who fought for the last ten, twenty or thirty years for a classic movie theater, but changing a name is better than losing the whole thing. All over the world arenas, concert halls, etc. are selling their names for large amounts of money. Art Houses bring prestige to any corporation that always want to be a good citizen. A “Kirin Cinema” or a “Mitsubishi Cinema” is definitely better than no cinema. C) Arcade or city support: A lot of the Art Houses are located in the center of shopping arcades that are struggling in most of the cities. They usually get a lot of financial support from the Government institutions or the cities. Many Art House owners already get support from them. They should all do, and not only for money, but also for advertising campaigns, etc.